Golden Pheasant Pad. Made from English Ringneck Pheasant feathers. 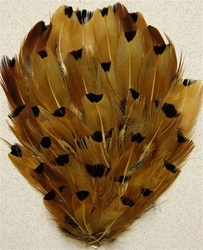 A rich natural golden feather with a little Black Irridscent tipping. This is also known as Golden Heart Pheasant. The millinery industry has used this pad for ages, always a best seller and good for headbands and crafts also. Sold by the DOZEN only.